Chapel By The Stream - Northern Lights Mountain Village Collectible. Spectacular fiber-optic LED holiday lights set our intricately detailed winter village apart from the rest! 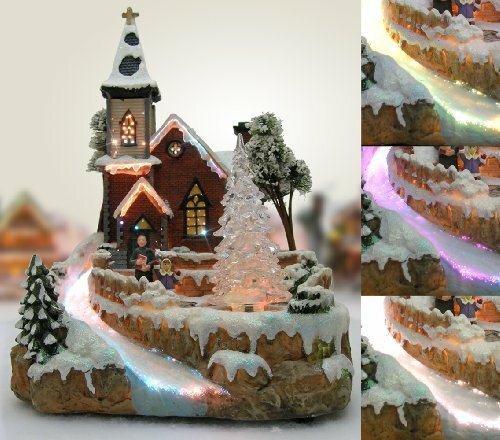 Superb quality of workmanship allows you to proudly and confidently display this item and watch the mesmerizing beautiful mountain village "come to life" with colorful fiber-optic motion lights! Collect one or a set. Measures: 9.75"W x 13.5"H x 9"D. Note: this item is one of 11 fiber optic LED buildings in the collection. Beautifully designed and fabricated fiber optic and LED changing color house. Measures 9.75"W x 13.5"H x 9"D and features Fiber Optic Lights which are A/C powered.